What’s better than sipping a cool drink by the pool this summer? Not having to count the calories! Beat the heat and keep the delicious flavor with some of these calorie-free, gluten-free, sodium-free and caffeine-free drink recipes made with Cascade Ice. 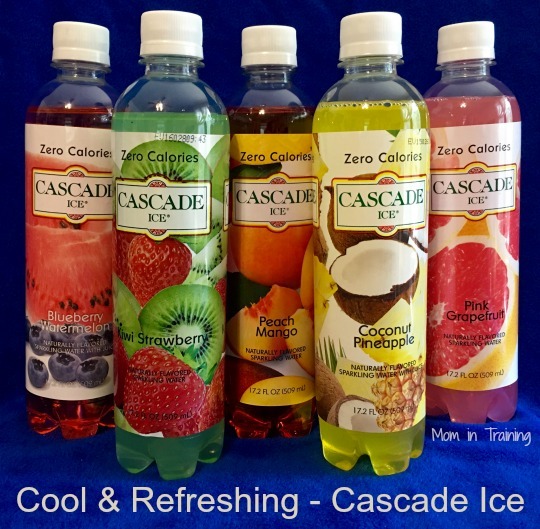 I like Cascade Ice because it is something you can keep in the fridge and enjoy cold by itself, or you can add in a few extra ingredients and have a fun drink. Introducing your new favorite frozen drink, the Cherry Limeade Fro-Yo Float! Start with 6oz of Cascade Ice Zero-Calorie Cherry Limeade, 3 cups of ice, 2 cups frozen yogurt. Combine ingredients in a blender until slushy and divide amongst friends. Garnish with fresh cherries and lime to really impress your guests! Whether it’s girl’s weekend or time for a mocktail, this drink is sure to cause a splash! In a blender, combine 4oz of Cascade Ice Kiwi, 1oz of Cascade Ice Wild Berry, 1 cup of ice, frozen berries of your choice, and rum if desired! Blend until slushy. Top it off with fresh strawberries and mint for the perfect touch and serve! If you haven’t used your ice cream maker yet this summer, here is your perfect excuse! In a blender, puree mango chunks and Cascade Ice Coconut Mango until smooth. Chill for 1 hour, and then freeze in your ice cream maker. When ready to serve, add 1/3 cup of sorbet to each glass, then fill with Cascade Ice Coconut Mango for this frozen, low calorie treat!